We arrived to a beach full of stars. For us, the Pacific Ocean beaches have never had stars—at least visible ones, that is. Nights walking up and down the Del Mar beaches in northern San Diego, evening strolls along the boardwalk in Santa Barbara, dimly-lit drives up the coast to Carmel-by-the-Sea….they are all simply covered in coastal fog, that defining atmosphere of the West coast beaches. And never any stars. But not this Pacific Coast. This Pacific beach sky is literally covered in stars, a lot like the star patterns I’m used to seeing up in northern Idaho, where there aren’t a lot of lights and where there’s almost nothing obstructing the view. This is the kind of view we saw as we kicked off our shoes, stretched our legs from the 4-hour drive from the Monteverde cloud forests, and walked in the cool sand along the Playa Flamingo. And then, as we walked, the lightning storm began. First, it was little more than quick flashes of light breaking up the dark sky flecked with starlight. But then, the storm became a kind of fireworks in the sky, a brilliant symphony of white flashes, lighting up cloud formations, highlighting the coastline, illuminating the twinkling lights across the ocean and along the coast. We sat down cross-legged in the cool sand and simply watched the magnificence of nature. And so began part three of our Costa Rican honeymoon. 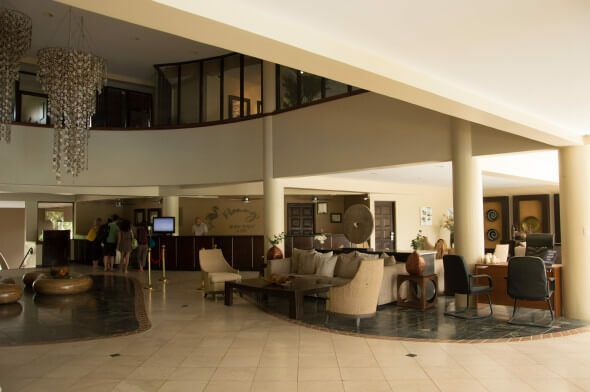 We’d spent the first few nights with TAM Travel at the base of the Arenal Volcano, the next one in Monteverde, and we’d just arrived at the Flamingo Beach Resort, where we’d be staying for the next two nights. After a few days of adventure travel and organic farming, we were more than ready to spend some time in the sand on our beach towels, snorkeling with the sea turtles, and swimming in the ocean. 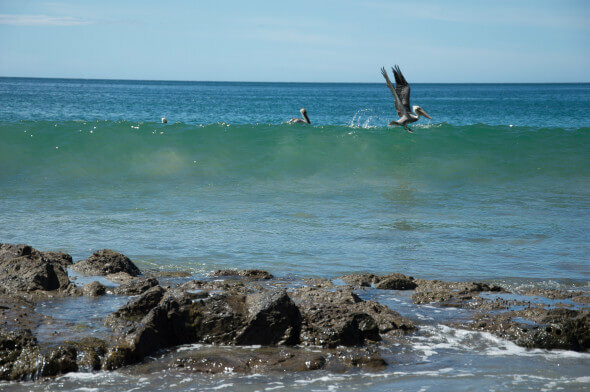 Plus, Playa Flamingo is a special beach: not only does it proudly hold the designation as one of Costa Rica’s Blue Flag beaches, it is protected and conserved by the staff at the Flamingo Beach Resort and has the softest powdery sands I’ve ever put my feet in. As we would later learn, the Blue Flag Ecological Program is an extremely coveted designation. The program itself was created in 2002 in response to the fear of beach pollution as a consequence of irresponsible tourism. 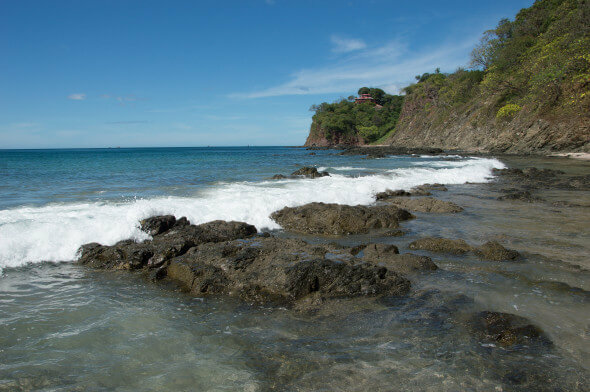 In order to combat the harsh effects of tourists on the ecology of its beaches, a number of Costa Rica’s preeminent organizations (such as Costa Rica Tourism, the National Water and Sewer Service, the Ministry of Public Heath, the Environmental Ministry, and the National Tourism Chamber), joined Blue Flag’s efforts to create a inter-institutional program that would require eligible areas to meet at least 90% of its minimum requirements by the end of each year. Among other criteria, the program tracks aspects such as microbiological quality of the ocean’s water, the quality of coastal sanitation (i.e., the lack of garbage, the availability of garbage and recycling receptacles, the way run-off water and industrial waste is treated, etc. ), and the kinds of environmental education programs that are offered in the local school systems. The residents of Playa Flamingo are incredibly proud of their commitment to their beaches and to the long-term sustainability of their land, plants, and animals, and as it would seem, the Flamingo Beach Resort is most certainly a part of this commitment. Not knowing any of this, though, we still sat in the sand, awed by the organic fireworks show happening all around us. We talked about our honeymoon so far, about our dreams to come back to Costa Rica, about our excitement for the catamaran cruise we’d be taking the next day. Costa Rica tends to have that kind of effect—the tranquil, contemplative effect—on people. After we sat for some time, we walked the few feet back to the resort and decided to have a late-night cocktail and dinner at Arenas, the resort’s Spanish-style hacienda beachside restaurant, which is open until 9:00 most nights. Like its commitment to beach sustainability, Flamingo is also dedicated to land sustainability, growing an abundance of its own fruits, vegetables, and herbs right on location at the resort’s organic farm. Arenas’ chef prides himself on using the garden’s ingredients in many of his daily dishes, and for what the staff can’t grow themselves (such as the grass-fed beef or the sea bass), they buy locally-sourced from farms and fishermen. We started our dinner by ordering two rounds of Green Monsters, a specialty cocktail made with cacique, the local liquor, and a bold green liqueur (and what a fantastic name, right?). For dinner, Ryan ordered the Ravioli di Fungi, freshly-stuffed mushroom ravioli covered in a tangy tarragon sauce, and I chose the Polly Curry, chicken topped with a delicious Carribean-style coconut curry sauce and served with vegetables and steamed basmati rice. The food was exquisite and delicate—perfect for a late-night beachside fare. We stayed and chatted with the servers about Tico life, local food, and life on the coast, until the restaurant closed. That night, we stayed in an Economy Room, which was—to our delightful surprise—actually the largest room we stayed in during our entire honeymoon. 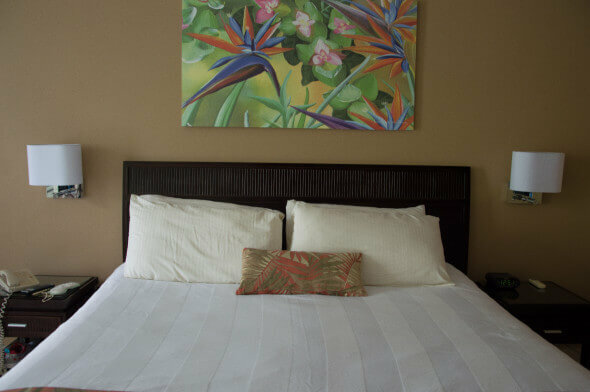 The room features a king-sized bed and a number of other standard amenities: flat-screen T.V., free wifi, coffee and tea maker (plus items for a fee in the fully-stocked mini-fridge), private bath with tub/shower combination, and complimentary bath products. Though our room didn’t have much of a view, we only had to step a few feet outside of our room to end up at the top of Flamingo’s magnificent steps leading to their thatched-hut swim-up bar, extensive pool, lounge chairs, and, just outside, kilometers and kilometers of white-sand beaches. Flamingo is a gorgeous resort, too—modeled after low-rise Spanish architecture on the outside but extremely modern and sophisticated on the inside, it’s the perfect combination of a 5-star beach resort and a refined urban hotel. We woke up late the next morning, brought books and beach towels downstairs, confirmed our sunset catamaran cruise with the concierge, and spent a few hours napping in the sun, searching for turtles and sea shells, and reading our books. At 2 p.m., a representative from Panache Sailing picked us up in the lobby and took us to dock at Playa Flamingo, where we boarded tiny motorboats and headed out to the catamaran for our afternoon boat ride. 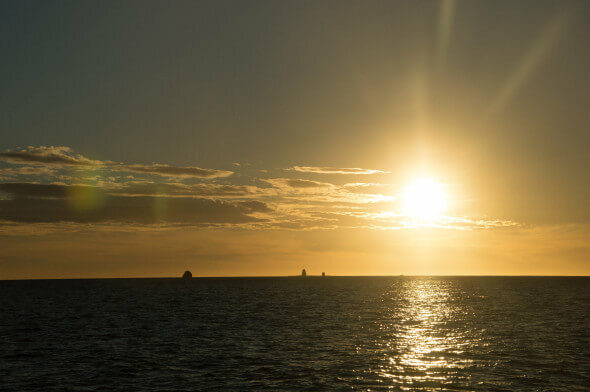 During the afternoon, we enjoyed complimentary cocktails, marveled at the Gold Coast, searched for dolphins along the horizon, practiced the art of snorkeling, and dove for mussels and sea anemones. After pulling up a few fresh mussels, one of the shipmates asked me if I’d ever had a raw mussel (as far as I could remember, I hadn’t), so he brought them back on board, gave them to the chef, and brought them back out moments later, chopped into fresh tiny pieces for us to enjoy. I loved every bite, feeling the slimy, chewy mussel slide down my throat. We ate them as the sun went down behind the rolling hills. By the time we got back to Flamingo that night, the stars were out again, brighter than ever. 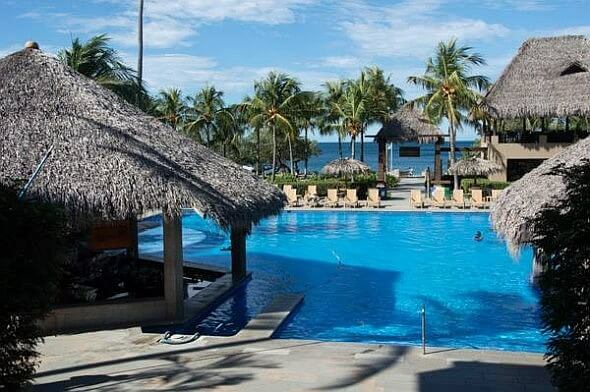 Flamingo Beach Resort, Playa Flamenca Santa Cruz, Guanacaste, Costa Rica: Rates for the high season (December – April) start at $95 USD/night, depending on the size of the room. 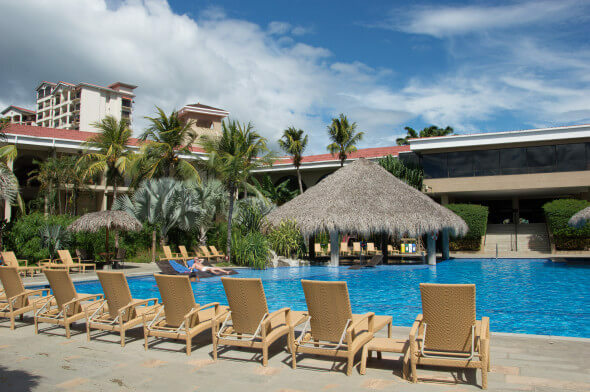 To book a trip to the Guanacaste coast in northwest Costa Rica, you can contact the amazing folks at TAM Travel Corporation to arrange everything for you (toll-free number from the U.S. is 1-877-826-8785) or you can book directly from the website. Compare rates on Priceline.